In October 1988, Iris and her mother, Mary Skatch, opened Mom's Pastry Palace. They ran Mom's until July 1991. In August 1991, Rick, Iris, Derek, Carl and Tania moved to Brandon, MB, where Rick began working as the sales manager for Great-West Life. Brandon was home for two years, after which Rick was promoted to be the Regional Manager for Great-West Life in Saskatoon. The Kennedy's are still residing there. Derek is attending the University of Saskatoon and is in the army reserve. Carl is living in Calgary and appren­ ticing as a drywaller. He is in the navy reserve. Tania is going into grade 12 and is planning a career in cosmetol­ ogy when she graduates. 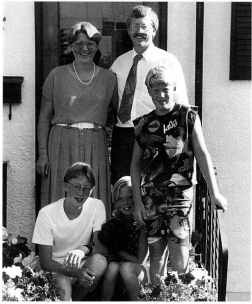 In October 1998, Mary Skatch decided to move to Saskatoon to be closer to her daughter, Iris, and her family. Mary had been living in Brandon before that time. Every winter she had been working in Swan River, cooking at the Bible College. Aulga Johnson was born in 1925 in the Scandinavia district, the youngest of ten children born to John August and Augusta Johnson. The family moved to Erickson about 1928.
were married on August 16, 1945. They purchased a house in Erickson where they resided until 1948. Robert was employed by Ted Neilson at the Erickson Garage and their oldest daughter, Glenda, was born in 1947. They lived in Clanwilliam until 1950, where their second daughter, Patricia, was born. Third daughter, Roberta, was born in Gimli, ME while Robert was serving a second term in the RCAP. The family spent the next 20 years in Saskatchewan in Saskatoon, Melfort and Nipawin. In 1970 they moved to BC, spending the next 21 years in Kamloops. Glenda married Glenn Schiiler. They have two sons, Brent and Barrie, and presently live in Sorrento, Be. Patricia married Lee Stalker. They have two children, Christine and James Robert, and live in Kamloops. Roberta married Robert Melander. They have two children, Robin and Renee and also live in Kamloops. Aulga died in 1977. Robert and his second wife, Doreen, are living in retirement at Kingsgate, BC. Lanny and LeeAnn Knutson came to Erickson in 1993 when Lanny was called as the pastor of Erickson Lutheran Parish and Onanole United Church. Lanny Dean Knutson was born July 6, 1943, in Canby, Minnesota. He graduated from high school in Windom, Minn., in 1961; recei ved a Bachelor of Arts degree from Augustana College, Sioux Falls, South Dakota, in 1965; and a Master of Divinity degree from Luther Theological Seminary, St. Paul, Minn., in 1969. On July 27, 1969, he was ordained into the Lutheran ministry. He served parishes in Bottineau, North Dakota, and at Glasgow Air Base, Montana, before immigrating to Canada in 1973. Since then he has been pastor at Christ Lutheran Church in Regina, 1973-77, and Christ Lutheran Church in Calgary, 1978-93, prior to moving to Erickson. LeeAnn was born Anna Lee Lucas on August 27, 1944, in Inglewood, California. When she was eight years of age, her family moved to the Clarks Fork Valley in Montana. She graduated from high school in Fromberg, Montana, in 1962, and attended Walla Walla College in Washington State and Eastern Montana State University in Billings, Montana. She taught high school choir, band and English prior to taking up a career in research/tech­ nical writing which led her to involvement in developing an adult education program for the U.S. Dept. of Health, Education and Welfare (1971-73). She has since broadened her experience into writing fiction and, while in Erickson, has published Johnny Gitcher Gun. She has also been a guitar teacher.